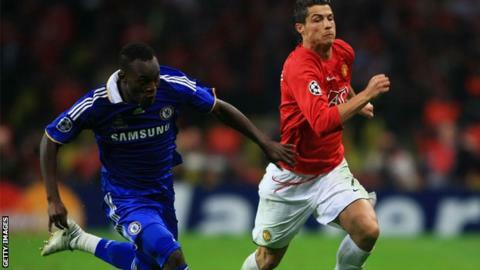 Michael Essien believes former club Chelsea will be hard to catch in the Premier League title race. The midfielder, 32, twice won the league during a nine-year spell at Stamford Bridge, including one success under Jose Mourinho in 2006. Essien thinks Mourinho could do it again with his side top of the table. He told BBC Sport: "There is still a long way to go but I'm sure they are in a good position and once Jose is ahead it is very difficult to overtake him." Essien, who now plays for AC Milan, sees similarities between the current Chelsea side and the one he played for when Mourinho signed him from Lyon during his first spell in charge in 2005. Made 256 appearances for Chelsea from 2005-2013, scoring 25 goals Played for Ghana in the 2006 and 2014 World Cup finals. Missed 2010 finals through injury. In an interview with BBC Sport, the Ghana international - who also played under Mourinho during a loan spell at Real Madrid - assesses the qualities of his former boss and Chelsea's prospects. He also discusses his work with the #UnitedAgainstEbola project, a campaign for Health Africa International launched to try and combat the threat of ebola and the potential impact of the disease on the up-coming Africa Cup of Nations. "It's not a big surprise they are doing so well. Whoever works under Jose will tell you that he is the sort of man who always gets the best out of his players. "The way they are playing now reminds me of when I first came to Chelsea. We were very hard to beat and we won most of our games and they are doing it this year. "They have a lot of young players who can step up. I think they are going to become like Chelsea of years ago. And they will win trophies for their club." "He is very close to his players and he knows how to talk to them. Sometimes he might ignore you a little bit just to get you a little bit angry and then go out there and perform. So he has his little ways to keep his players going. "He is not scared of anyone. Sometimes he is too honest, but you don't have to take it personally. You have to prove to him that when you are on the pitch you are better. And that's what he wants." "There was a joke about me on the internet that I have got ebola. I said this in not a joke and I came up with this campaign to try and educate people in Africa about the disease. "I was not worried. I had not travelled to Africa. I was fine. I was in good health. People around the world were more worried about me so I tried to calm everybody down. "I'm still working on it to try and get some of my team-mates and people I know to get involved and to promote this campaign and try to raise awareness and to raise money for those who need it. "The most important thing is when someone has the virus how to deal with the person and how to go close to the person. "They have had to change the venue. So if we can all join together to solve this problem I think it will be very good for Africa. "Some of the players will be a bit concerned. They will be a bit worried. But I think everything will be fine and I hope the Nations Cup will go on and we will have a fantastic tournament. We are crossing our fingers that the whole thing will go on and nothing will happen. "They should feel safe in going and representing their countries. Hopefully the tournament will go on and we won't get any bad news."